Home Minister Rajnath Singh and Uttar Pradesh Chief Minister Yogi Adityanath on 5 September jointly flagged off 8.5 km stretch of the first phase of metro train in Lucknow. The metro services will be opened for public use on 6 September on the 8.5-km-long 'priority corridor' from Transport Nagar to Charbagh rom 6 a.m. to 10 p.m. every day. 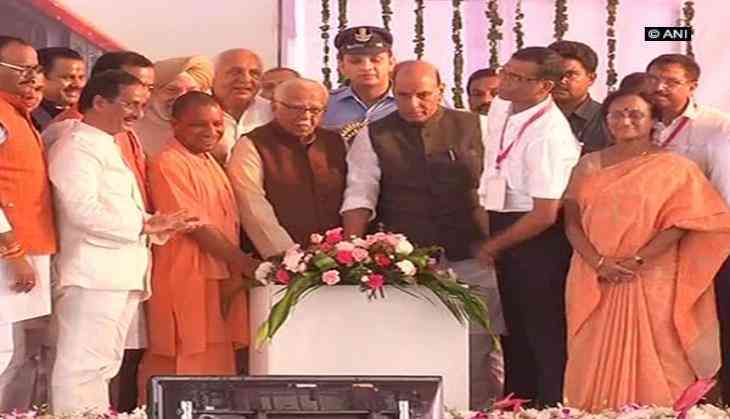 Addressing the gathering at the inaugural ceremony of the Lucknow Metro, Adityanath said, "The wait for travelling in the Lucknow Metro is over. The services will be opened for the public use from tomorrow. The metro service will help reduce air pollution in the state capital in the long run, will contribute to savings in terms of money and time for the passengers." Adityanath further averred it was Prime Minister Narendra Modi government at the Centre which contributed the bulk of the funds to the project. "The UP Government is working on the lines of Prime Minister Modi to fulfil his every dream for the betterment and development of country. I am thankful to the whole team who made the Lucknow Metro project a reality. I am grateful to Governor Ram Naik, who inspires me to work tirelessly," he said. Adityanath also apprised that the Government is planning to bring the metro in at least seven other cities in Uttar Pradesh. "We are planning to bring the metro in Kanpur, Agra, Varanasi, Allahabad, Gorakhpur, Jhansi and Meerut also," the UP Chief Minister mentioned. Rs. 6,00,080 crore have been spent in the Lucknow Metro Project. "We have spent overall Rs. 6,00,080 crore in the construction of the Lucknow Metro. The amount of Rs. 13,000 crore was given by the Indian Government, Rs. 278 crore was spent by the UP Government and Rs. 3,502 was spent by the European Investment bank," informed Adityanath. Expressing his happiness over the inauguration of the first Lucknow Metro, Rajnath Singh asserted that the dream of smart city has started with the metro and the dream of the Smart City will be fulfilled soon. "Today is a historic day not only for Lucknow, but for the entire Uttar Pradesh. Lucknow 'Metro Ka Shehar' will bring new opportunities for the city," he said. "Whenever we think of infrastructure we look towards future. Infrastructure should cater to the need of the next 10-15 years," he added. Singh has dedicated the Metro project to former prime minister Atal Bihari Vajpayee and thanked Prime Minister Modi for the same. Metro Man E. Sreedharan, MP Kaushal Kishore, Cabinet Minister Rita Bahuguna Joshi, Hardeep Singh Puri, Swati Singh, Basic Education Minister Anupama Jaiswal and Suresh Rana marked their presence at the inaugural ceremony.